Romantic bangla love sms for husband. Are you looking for some romantic for your boyfriend or your husband ? than, you are here the right website, here you will get many love sms for your husband, that you may not share before in your marrige life, in marrige life should have some fun text and speach with husband and wife, So lets share these sms and get unlimited happyness. Bari fire Raja bollo eta holo ki ? Rani bole eta chilo Miss Call, tao bujhoni ? Ei Mon chay sudhu thakte tomar Pasapasi ! Ekta pori esechilo amar kache, se bollo : ki chai bolo ? R akta pori ami dite parbona. Jano ami ki Cheyechilam ? jonno kono jaiga nai ! Karon tumi to amar Heartbeat ! 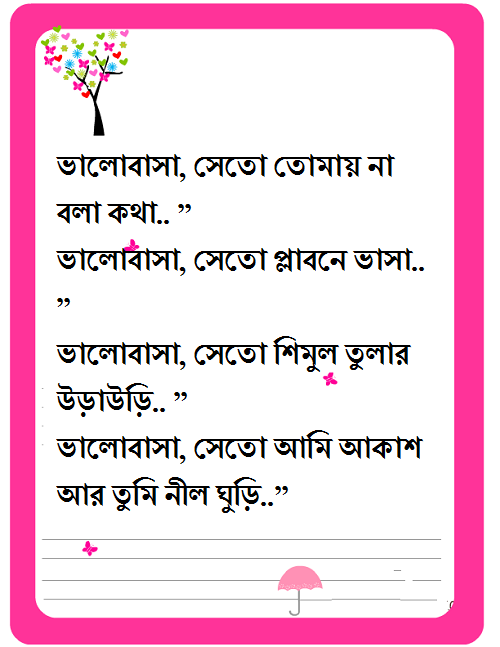 Tumi amar ashar Alo, Adhar rater bati..
Tumi amar sunno jibon e ek matro Sathi. Tumi amar chawa-pawa, tumi e sokol Sukh. Tomay pele dhonno Hobo, jhurabe ey buk..! Chad Jodi Pare Rat Ke Rangate.